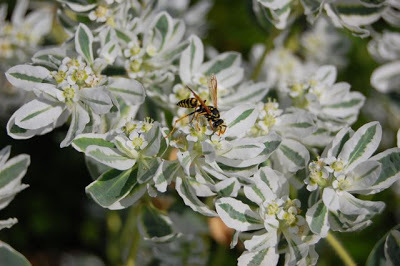 Today’s oblique musical reference is about Euphorbia marginata, also known by evocative common names such as snow-on-the-mountain, smoke-on-the-prairie, ghost weed, or summer icicle. All refer to the frosty-edged bracts of this Poinsettia cousin, in “bloom” right now in sunny Toronto gardens. The “fire” in this icicle relates to the toxic milky sap, common to all euphorbias, that exudes from its cut stems and can cause intense skin irritation. Use sensible caution, such as wearing gloves when weeding, trimming or cutting the stems for bouquets. Even if wearing gloves, don’t do anything silly like rub your nose or eyes if you have sap on your hands. And watch out for splashes from any water the newly cut stems have been sitting in. That being said, I’ve read that you can condition them to make a handsome addition to flower arrangements – and perhaps floral expert Deborah at Kilbourne Grove can set me straight here – by dipping the cut ends in boiling water for half a minute, or simply by rinsing the sap off under the tap till it ceases to ooze. They’re said to make long-lasting additions to the vase. This hardy annual euphorbia self-seeds, and sometimes arrives in gardens without being invited. I wish it would do so in mine, as it can be a nice foil for the hot colours of late summer and autumn. Like Poinsettias, the colour comes mainly from the variegated, leaflike bracts. 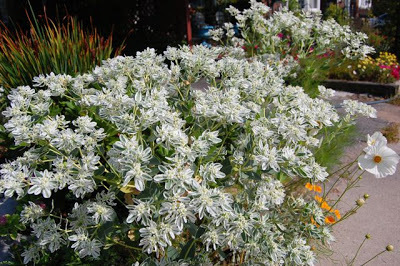 However, the tiny white flowers are attractive to bees and butterflies. P.S. For any garden bloggers at the Garden Writers Association conference in Raleigh, North Carolina this weekend, keep watch for our own Toronto Gardens gal and inveterate Tweeter, Sarah Battersby. Wish I could be there – have a smokin’ time (and, possibly, have a frosty one for me). A friend of mine just gave me a start from her garden this past summer. I must say it is doing wonderfully. When I posted it on bloom day everyone told me it would self seed everywhere-I hope not but for now I am enjoying it. Hi Helen! It's a pretty plant and it's even prettier when planted in masses, as I can see from your first picture. I like the names of this variety. My E. started to seed, and I am happy. 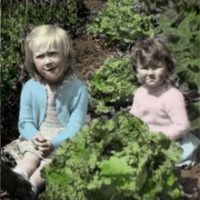 I move the babies to different spots in my garden. No trouble with its milky juice, so far. But thank you for reminding! Wish it was a perennial that didn't self seed. Hey Helen, both of those methods work for the euphorbia. If I need to recut it shorter, to put in a vase arrangement,(after the original conditioning) I will light a candle and just sear the ends over the flame. Can you let me know if you received my e-mail OK? You're right to warn about the sap! When I was a very new gardener, I got some euphoria sap in my eyes and spent a delightful afternoon at the ER having my eyes flushed out. I'll still grow euphorbia but I approach with caution! It is a cool looking plant. And a relative of poinsettia, huh? It would actually look great potted next to a red poinsettia around Christmastime.